Colored Popups: You can change the color of popups that appear if a battler takes HP damage while it is affected by a state with the notetag <Damage Color: r, g, b, a>. You can change the color used depending on the values you insert. Weak Popup: A new popup is added so that when an elemental weakness is hit, this popup will appear to inform the player. You will have to modify your damage graphic to add the Weak popup. Instructions will be explained below. Break Popup: A new popup is added so that when a certain state with the <Break Popup> notetag is added to a battler, the Break Popup appears. You will have to modify the damage graphic to add the Break popup. Instructions will be explained below. With vanilla RPG Maker MV, buffs and debuffs will overwrite the turn count whenever a new buff or debuff is applied. The plugin parameters here let them stack the turns with each other instead. You can set a maximum number of turns for the buffs and debuffs so that they don't become too high. If you use Yanfly's Buffs and States Core plugin, states can be changed to stack turns with each other. If you wish to give the states a maximum number of turns, you can use the <Max Turns: x> notetag inside that state. You can transform some skill or item target scopes into something else, like a skill that normally targets all enemies to focus on one, or one to all. These can be done with the notetags that are to be placed inside of a state or other main property notebox. You can also make some skill or item immune to scope target changing with the <Bypass Target Change> or <Divine> notetag, too. 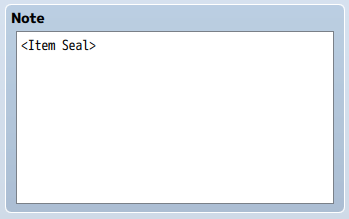 Look in the notetag section for a list of all the target changing notetags you can put into your database objects. There are new notetags you can use for skills and items to change the multiplier for the battle rewards the player can apply to battle like <JP x5>, <EXP x10>, or <Gold x200>. The effects will only last the current battle and will be reset once the battle is over. Only one reward can happen at a time as they will overwrite each other. This feature requires Yanfly's Battle Engine Core. You can make states that if a battler is affected by them and performs a certain action type (physical, magical, certain hit, or physical/magical), a follow up skill will happen after. Make some skills used to hold other skills, if the actor knows them. When they are selected in battle, a new window appears listing those skills. If the actor does not have access to them, those skills cannot be used. The skills picked from the new list will function as normal skills. There are more effects that don't belong elsewhere, but some of them include notetags like <Item Seal>, <Destroy Weapon>, and more. Please look at the notetag list for them. Changes skills/items with the self scope to become an all scope in battle. Does not affect skills/items with the <Bypass Target Change> notetag. Changes skills/items with the all allies/enemies scope to become 1 ally/enemy scope in battle. Does not affect skills/items with the <Bypass Target Change> notetag. Changes skills/items with the 1 ally/enemy scope to become all allies/enemies scope in battle. Does not affect skills/items with the <Bypass Target Change> notetag. Makes this skill/item immune to the target scope change notetag effects. Replace the numbers. Changes the multipliers for the rewards found in the current battle. JP will require Yanfly's Job Points plugin to have an effect. After the battle is over, the multipliers will reset. 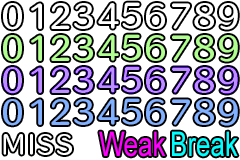 The multipliers do not stack and will overwrite each other, even if they are different types. Destroys the actor's currently equipped weapon after it is finished using a skill with this notetag. Puts the skills x in a new window as a list to select from, turning this skill into a folder during battle. This does not work outside of battle. The actor must have access to all of the listed skills in order to use them. 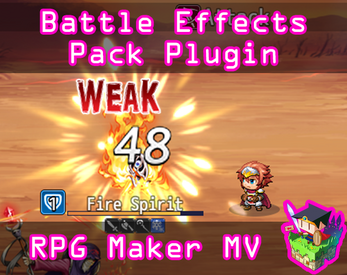 Makes the battler receive x% multiplier from all elements. If a battler receives a state with this notetag, the Break Popup will appear. It will take priority over the Weak Popup. 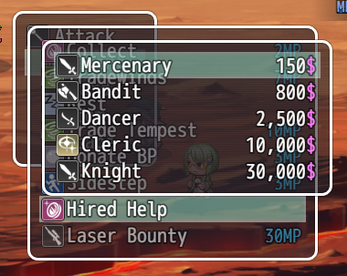 Replace x with the parameter ID to make the battler immune to receiving buffs or debuffs of that parameter. This does not remove already applied buffs or debuffs. It only stops the battler from receiving them. If the battler receives HP damage while affected by a state with this notetag the popup color will change. If an actor is affected by a state with this notetag, they cannot use items from the actor command menu. Sets the maximum number of turns this state can be to x. This is used for Yanfly's Buffs and States Core if you allow state turn stacking. If the battler is hit with an elemental weakness while affected by a state with this notetag, the Weak popup will not appear. This requires Yanfly's Battle Engine Core to work. This makes the battler affected by this state to perform skill ID x after the current skill is finished being used. 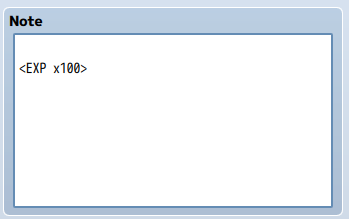 Insert the IDs of the states that the battler cannot receive if they are affected by a state with this notetag. They do not become resistant to it, meaning if the states have already been applied, they will not suddenly disappear, but they will not be able to be applied until this state is gone. Sep 21 2018: Bug fix for popups not clearing and Move Y Base and Rate plugin parameters not working. They should be working now!